Conformation Showing - what most of us think of when we hear "dog show". Conformation is judging a dog against the ideal as described in the AKC Breed Standard. Structure, coat, temperament, and "breed type" are all evaluated. Obedience training is a must with a German Shepherd. An uneducated dog is a problem dog. The obedience commands that are so handy in every day life are also the basis of Obedience and Rally competition. From the basic requirements of the Rally Novice title to the highly skilled performance of the Utility dog, there are challenges for everyone. But first and foremost, obedience training is a tool to increase the teamwork between you and your German Shepherd Dog. The AKC also offers a "Canine Good Citizen" test (CGC) that tests a dog's manners in public. Some counties offer discounts on licensing if a dog has passed this test. This is the fastest growing dog sport in the world. Based on horse show jumping, agility has dogs and owners going through an obstacle course of jumps, weaves, tunnels and the like. While some competition is at a world-class level, there is a level for all degrees of competitiveness. Most of all, it is great exercise and fun. The availability of herding is limited by the fact that most of us no longer live on farms nor have stock. However, there are herding facilities offering training and trialing in our area. Again, great mental and physical exercise and the thrill of watching the dog's instincts kick in. They know a lot more about herding than we do! Ever watch K-9 Cops and marvel at the scent work of the police dogs? They search for contraband and do so with great joy. Ever wondered if your dog could do that? Yes they can, although you wont be hunting for drugs or explosives. Your dog can detect articles scented with the essential oils of Anise, Birch and Clove, etc. Scent Work is good for building the dog/owner bond. It is an excellent way to keep a dog's mind active. Entry levels are something all dogs/owners can succeed at. As the levels advance, the skills required and the teamwork between dog/handler also advance. This is the perfect sport for Northwest dog owners as you can do lots of practice indoors during the worst weather. We are in a hotbed of Scent Work activity with many local qualified teachers. A dog's sense of smell is incredible and watching them work is pretty awesome. Getting out in the morning and enjoying the morning dew with your dog is also good. Like most other titles, this comes in different degrees of difficulty from the basic Tracking Dog title to the Variable Surface Tracker title. As dog owners we know of the positive effects our dogs have on our lives. Many of our dogs routinely go to hospitals/rehab facilities/residential facilities/schools and many other places where the dogs can provide the comfort that only a pet can. It takes the right dog with some specific training and an owner willing to commit to consistent visitation. But the payoff it terrific for both the person being visited and those of us who do the visiting. And there is no doubt that the dogs know it is important. Most facilities require the dog to have a CGC certificate. There are professional search and rescue dogs and in many cases they are supported by many volunteer dog teams. This requires demanding training for both dog and handler and there is a huge commitment of time. But the payoffs are great. There are a number of S&R groups in the area. One of the breed worthiness tests developed to test a dog's trainability, nerves, and work drive is this 3-stage test of obedience, tracking, protection. 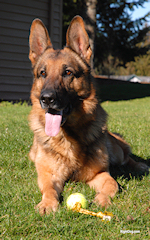 The AKC recently adopted a version of the internationally recognized performance test. The GSDCA-WDA offers the SV version. Again, it requires a huge commitment of time and effort as this is not an easy title.